This is one of those one-pan supper dishes that looks impossibly healthy and also tastes great. The colour combination of green and egg yolk yellow is vibrant and never fails to make me feel hungry. 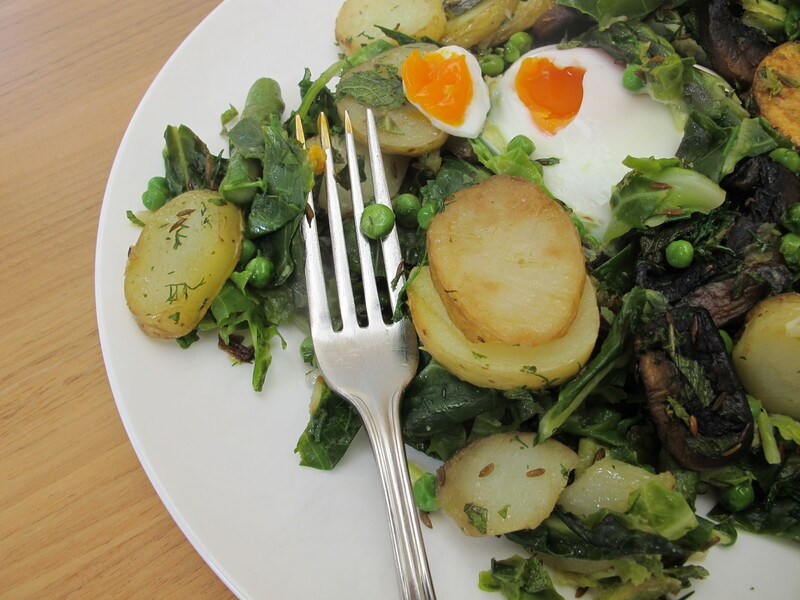 You can vary the type of mixed greens or herbs used, but the eggs and potatoes are essential elements. If you’re really hungry serve with a side of roasted sweet potato wedges, or toasted sourdough. 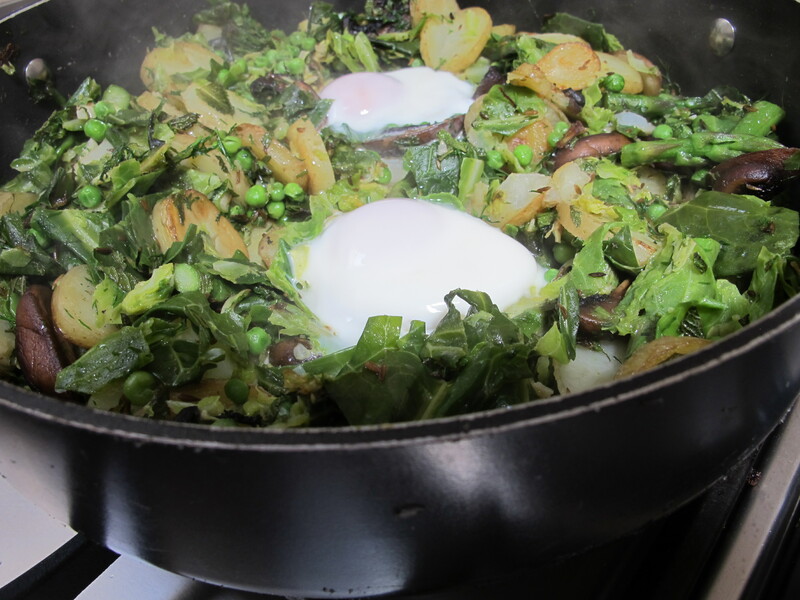 This time we had some spare mushrooms in the fridge so we browned them first in a separate frying pan then added them to the greens. As we used spring greens, which take longer to cook than spinach, we boiled them briefly in a separate saucepan before adding. In a large frying pan (a wide one with a lid), heat the oil over a medium heat and fry the potatoes for five minutes until turning golden. Add the mixed greens and cook for a further 3-4 minutes until wilted. Stir in the garlic, cumin seeds, fresh herbs and peas. Taste for seasoning. Then cover and cook for a few more minutes until the greens are tender. Take 4 eggs. Make 4 wells in the vegetables and crack an egg into each.Cover and cook for 5-6 minutes until the whites are just set. Sprinkle with a few more herbs, check the seasoning. Serve with a dollop of natural yogurt on the side. This recipe is from Good Housekeeping magazine. This entry was posted in A love of food and tagged Andalucia, food, living abroad, recipes, Spain on October 28, 2018 by sandradan1. 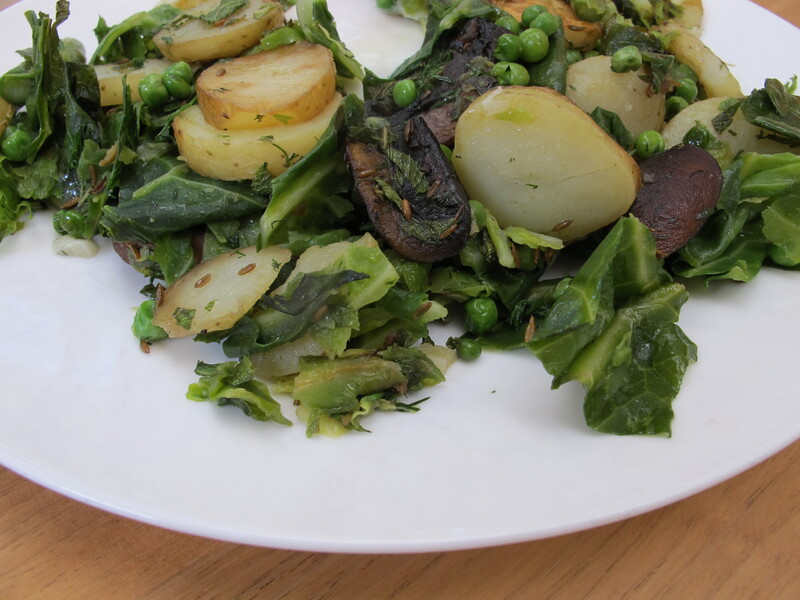 ooh you have given me thought for dinner, we have so many greens from yesterday’s market explorations, this will be a perfect way to use some of them this evening!